The last time the Americans won the gold was in 1980, when the U.S. defeated the Soviet Union in the "Miracle on Ice" and then went on to win their final match against Finland. 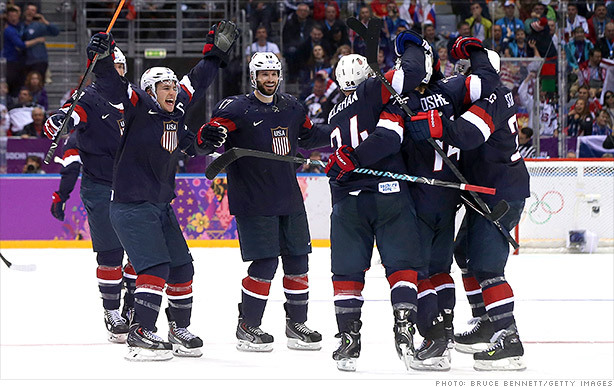 While the Americans and Canadians are teammates in the NHL, it's all about national pride during the Olympics. And Friday's semi-final match was even more crucial after the U.S. women's team's heartbreaking loss to Canada on Thursday for the Olympic title. With so much pride on the line, Wall Street traders -- who are usually talking markets all day on Twitter -- were instead chatting about the game, which began at noon on the East Coast. Sal Arnuk, partner at Themis Trading, admitted he was watching the game and that he was also keeping an eye on tweets from Mark Cuban. Leigh Drogen, founder of Estimize, was also focused on the match, tweeting his observations every few minutes. Michael Antonelli, an equity sales trader at Robert W. Baird & Co., joked that his day was over and was also commenting on the game. DailyFX currency analyst John Kicklighter quipped that the hockey game was the only reason for interest in the exchange rate between the U.S. and Canadian dollars.